Summary: Kelsey Finkelstein is fourteen and FRUSTRATED. Every time she tries to live up to her awesome potential, her plans are foiled – by her impossible parents, her annoying little sister, and life in general. But with her first day of high school coming up, Kelsey is positive that things are going to change. Enlisting the help of her three best friends — sweet and quiet Em, theatrical Cass, and wild JoJo — Kelsey gets ready to rebrand herself and make the kind of mark she knows is her destiny. My review: I realized that while I was reading Freshman Year & Other Unnatural Disasters I had developed a serious problem. I was addicted. TO THIS BOOK! Meredith Zeitlin's novel is so much fun, so witty, and so good I didn't want to put it down. And at times I had to, like to go to school or do my French homework or head out to dance class. No matter how busy my day was, I always made time to sneak in some reading. Why was I so addicted? One word: Kelsey. Well, two words: Kelsey Finkelstein. She's fourteen and a freshman in high school, which I'll be next September. This is going to be her year, her time to shine. As a teen, I know that feeling. Although high school is definitely a bumpy ride (sorta like middle school), Kelsey makes it through--even if things don't always go as planned-- with the help and support of her friends (even when they experience their own dramas with each other). I thought the things that happened to Kelsey were so realistic and the way she handled them were laugh out loud funny. Since this is written in first person point-of-view, having so many of Kelsey's thoughts really helped bring her character to life. I easily related to Kelsey and her friendships and how things in her life don't go as expected. Her group of close friends--Em, JoJo and Cassidy--were all diverse and unique in their own ways. Next to Kelsey, my favorite friend was the shy Em, someone I could really relate to. Kelsey's parents came across as kind of stereotypical with their blaming Kelsey's normal teen ways on "typical adolescent behavior" and this is something I see in a lot of the MG and YA I've read. Her mom could be sweet and caring at times and her dad wasn't really around much. I was going to mention I didn't think freshmen drinking vodka was all that common until a fellow eighth grader, a boy, got busted for bringing vodka to school so my semi-negative remark became a positive one. I realized that just because it may not be happening at my school didn't make it "unreal," until it did become "real" and someone got expelled at my school for drinking while I was reading this book. 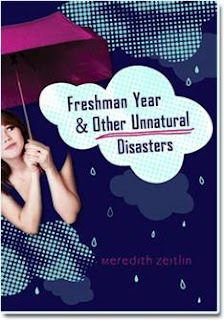 Join the journey of the first year of high school, Kelsey Finkelstein style in Freshman Year & Other Unnatural Disasters. The year is going to be rough, extremely humorous, a bit awkward, but soo worth it in the end. I have since begun learning how to handle my addiction and I can only hope that Ms. Zeitlin will continue the hilarious antics of Kelsey and Co. with three more books (for the remainder of high school). I can't imagine what Kelsey will do as a sophomore. Favorite excerpt: "Paper guy chuckles. "Nice. Hey, Lexi wrote a great article for the new issue, by the way." Aha! I knew he remembered her name. Now he'll probably ask me for her number, right? "Oh, yeah--she was really excited about it. she won't let me read it until it's published, though, so I haven't seen it yet. I'm psyched for her." "Well, I shouldn't do this, buuuut," he murmurs quietly, looking around like he's about to do something extremely dangerous and top secret. It's very cute and silly, and makes me almost not hate him for being so cocky all the time. He reaches into his bag, whispering now. "If you want a sneak peek at it, I happen to have a copy of the new edition with me. Can you keep it under your hat?" He holds out this month's Reflector and then snatches it back when I reach for it. "I need you to swear! I'm breaking all kinds of protocol here!" "Gee, I don't know," I hesitate, playing along. "I mean, are you sure you can trust me with something of this magnitude? I've been known to cause trouble for your staff." His phone buzzes and he glances down at it to read the text. "Oh, gotta split. See ya!" And then he's gone. I'm about to dive into the paper to figure out what he was talking about when I'm summoned to the stage. Dammit! I shove the paper in my backpack to look at later. We're halfway through the run-through of the opening number when I realize . . . I still don't know Newspaper Guy's name." Cover comment: I find the cover extremely cute. Book source: From publisher for use during a book tour and for my honest review.